The dogwood, or Cornus genus, is a category of flowering trees consisting of approximately 50 species. Though the origin of the name "dogwood" is unclear and ascribed to everything from the thought that the hard wood was used to make daggers to the peculiar, unique smell of freshly cut dogwood trees, it is certain that these flowering trees and shrubs are captivating to gardeners and nature enthusiasts alike. 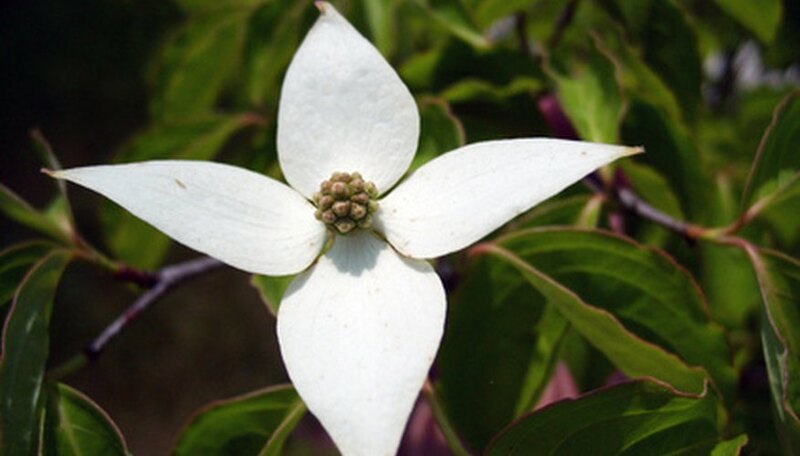 Three distinct types of dogwood trees are commonly found within the state of Ohio. Flowering dogwood is found throughout the eastern United States and the entirety of the state of Ohio. Known scientifically as Cornus florida, the flowering dogwood tree is found in the wild but is also grown as an ornamental cultivar. Flowering dogwood trees prefer moist, well-drained acidic soil and full sun to full shade. 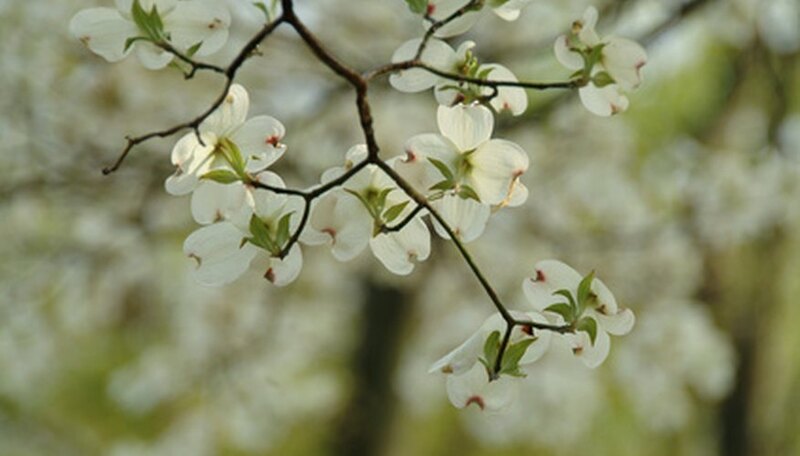 Under ideal conditions, the flowering dogwood tree grows up to 15 feet tall, but the tree is subject to stunted growth when planted in dry, rocky, clay or alkaline soils. Cornus florida is characterized by smooth, oval green leaves. From mid-summer through fall, the leaves turn a rich, vibrant red or purple and curl or warp in shape. Wild flowering dogwood trees produce white blossoms in mid-spring. Cultivated varieties possess white, pink or red flowers. Flowering dogwood bark is gray-brown with deep, scaly fissures. Unlike the flowering dogwood, silky dogwood, or Cornus amomum, is a large shrub. Native to Ohio, this plant grows rapidly and prefers moist or wet habitats and is highly adaptive to other planting conditions. Found throughout the entire state, silky dogwood grows up to 10 feet in height and 10 or more feet in width under optimal conditions. 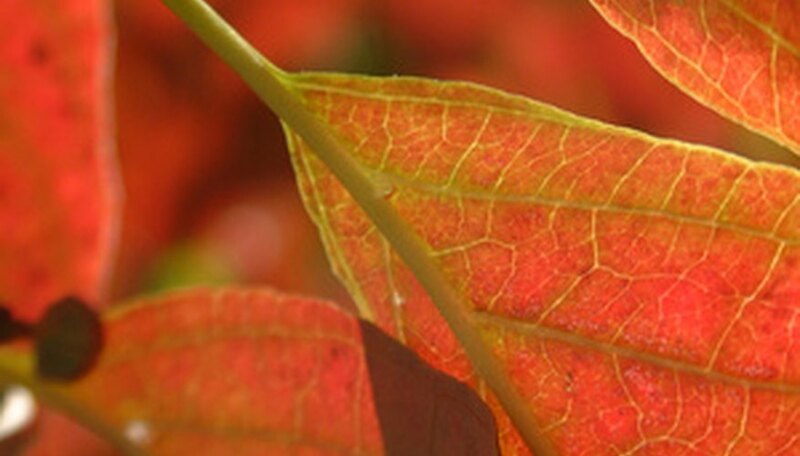 Silky dogwood leaves are smooth and elliptical with prominent veins. 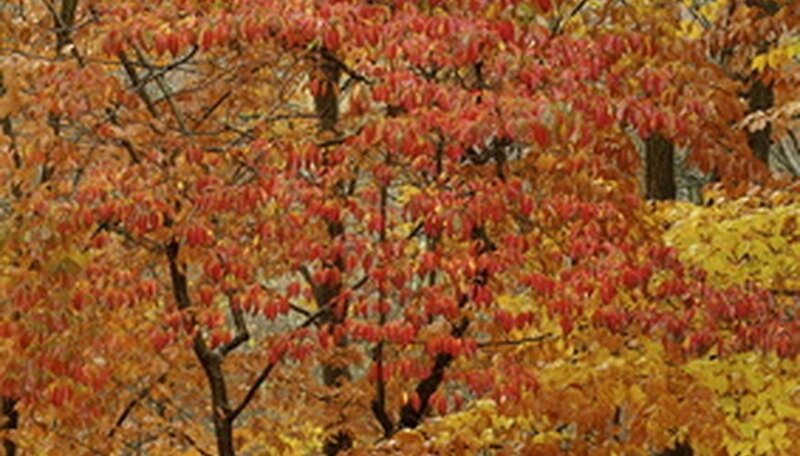 Autumnal coloring varies from vivid yellow to bold red. Flowers are small, white and unobtrusive, appearing on the shrub in mid-spring. By mid-summer, silky dogwood sports blue-black berries that attract and feed wildlife. The bark of this plant is almost identical to that of flowering dogwood. Cornus kousa, or the Japanese Dogwood tree, is not found in the wild in the state of Ohio. Instead, this plant is a common ornamental tree grown in cultivated settings. A popular alternative to the flowering dogwood tree due to it's longer blooming time, Japanese Dogwood is a small tree that prefers alkaline soil. The blooms of Japanese Dogwood are white in color with pointier petals than flowering dogwood. Japanese Dogwood blooms in late spring to early summer and is more resistant to pests and diseases than flowering dogwood. Leaves are prone to scorching in dry temperatures, leading the foliage to curl and warp in hues of red or purple by early fall. Japanese Dogwoods grow in full sun to partial shade and mature to a height of 20 feet tall.